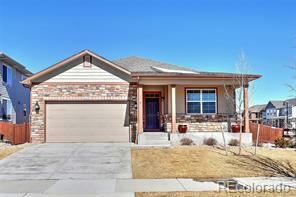 Gorgeous ranch w/finished basement on a corner lot with 993 sqft garage! Wood beam ceiling details in great room and charcoal maple kitchen cabinets add style while white oak flooring and granite counter tops add a classic feel. Coffered ceiling in master, luxury bath w/free-standing soaking tub, dual-head shower and large walk-in closet. Electrolux appliances include 32" built-in freezer/32" built-in fridge, double ovens, 36" gas cooktop w/vented hood, dishwasher, microwave and beverage fridge.